Margaret “Peggy” Irmen died on Sunday, September 16, 2018, at the Lutheran Home of the Good Shepherd in New Rockford, ND, at the age of 93. Margaret Gwendolynn Irmen was born on March 13, 1925, in Fargo, ND to Thomas and Esther Olson. Peggy graduated from New Rockford High School. She married Walter Irmen and moved to the farm and became homemaker to 11 children along with caring for foster children. Peggy was one of the kindness people you ever met, she opened her heart and home to many children over the years, teaching and leading by example of what a good mother really was. Peggy worked at the Cathay Public School as a cook and later went to work at the New Rockford hospital nurse assistant. Peggy is survived by children, Tony (Susan) Irmen, Robert (Cheri) Irmen, Kathy (Rusty) Hewitt, Margaret Wittmann, Don (Ann) Irmen, Karen (Wayne) Seckerson, Greg (Linda) Irmen, Steve (DeeDee) Irmen; Son-in-law Gus Lange, Daughter-in-law’s Sonia Irmen, Pennie Irmen; 32 Grandchildren, 54 Great Grandchildren, and 3 Great Great Grandchildren; 2 brothers: Ralph (Janice) Olson, Arden Olson. Peggy is also survived by her many friends who became her family. Donations in her name can be sent to; Lutheran home of the Good Shepherd, 1226 1St Ave N, New Rockford, ND 58356, funds to be used for new dishwasher and Ronald McDonald House Charities, 4757 Agassiz Crossing S, Fargo, ND 58104 as she loved and cared for all children. The Family extends their sincere thanks, appreciation and gratitude to all friends and well-wishers for the calls, visits, time, resources, cards, flowers, tributes, etc. during this time of celebrations and reflection of Peggy. followed by a prayer service at 7:00PM. Will miss this great Lady, prayers from the Ryan family. Peggy was such a wonderful, kind, thoughtful woman and such a beautiful person inside and out. She and Walter were the ONLY people who came to visit me when I left for college in Rapid City SD – they just showed up at my dorm one afternoon with smiles big as you can imagine! So great to see them and I have thought of that visit and their taking the time so many many times. Rest in Peace Dear Lady! Aunt Peggy always had a smile and a contagious laugh. She was compassionate and full of life. My memories of her as a child were so pleasant. Her cooking was excellent and I called her often to ask for recipes of things my mom made and I could not find the recipe and she knew how to make it. My mom and her were very close and I remember the last time I brought my mom to see her before she died and how hard it was for them to say goodbye. Now they are once again united along with others they all loved. I will miss you Aunt Peggy you leave a hole in my heart but I am happy for you that you are finally completing your journey and reunited with all those you love. Love you! 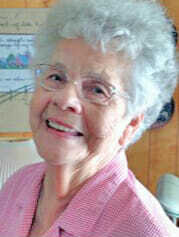 I grew up with this beautiful lady, the whole family good friends and neighbors in the Bremen days. She was a gentle woman and very caring, Kathy u are the image of your mom so pretty. Due to my medical condition this is the best I can do you have our love and prayers will be thinking of you. Oh Peggy I miss you so much , my heart hurts so much , you were the kindest lady I ever cared for in all my work of being a CNA . Love you so much .